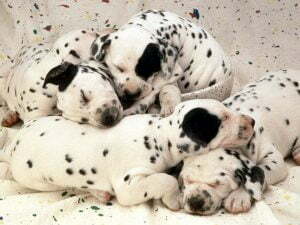 Dalmatian puppies are pure white when first born, with most of their spots appearing within the first 4 weeks. Spots continue to develop throughout the dog’s life, varying in size from a few millimetres to several centimetres across. Patches on the ears are common, though this is an undesirable trait in the show ring. With a short dense coat of fine stiff hairs, the Dalmatian is a low maintenance breed as regards grooming. However, it has two heavy moults and is a prolific shedder throughout the year. 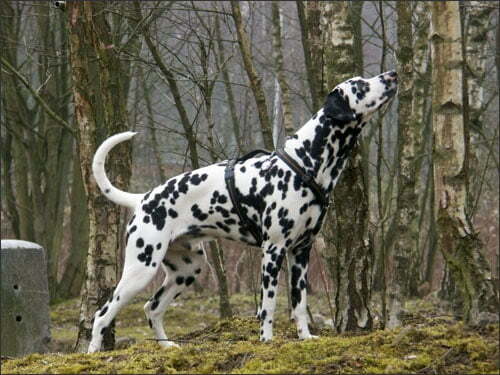 Regular brushing will help to minimise this, but the Dalmatian is not a good choice for allergy sufferers. Fastidiously clean, and with a low oil content to its coat, the Dalmatian lacks the typical doggy “odour” associated with other breeds. Bathing should be kept to a minimum, as this tends to dry the skin. Often, a wipe over with a damp towel will suffice, paying particular attention to the ears and eyes. Dalmatian toenails tend to grow faster than other breeds, and may require regular clipping. The Dalmatian does not fare well living outside, being unable to tolerate extremes of weather. It also has a sensitive skin and can be susceptible to allergies, though this can be minimised by avoiding synthetic materials and chemicals. 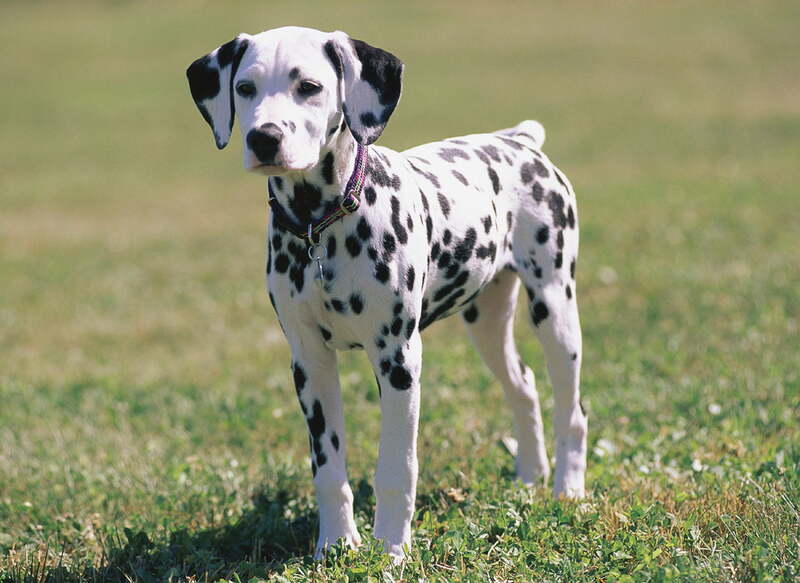 The Dalmatian is prone to deafness, which is inherently present in around 12% of all puppies. For this reason it is essential you buy your pup from a reputable breeder, who can provide proof the dog has been BAER-tested. Although deaf Dalmatians can still make good pets, they should be spayed or neutered to prevent breeding. The Dalmatian has a tendency towards urinary stones, and cannot tolerate a purine-rich diet (such as liver and beef), as this causes a uric acid build up. However, this is easily controlled with a good quality diet – your vet can advise. Diet is an important factor in keeping a “Dallie”, as the most common ailment by far is obesity. The Dalmatian is a non-fussy eater and will happily scavenge from bins and the table, which must be discouraged. A fun-loving, intelligent, and active breed, the Dalmatian thrives on human company. His love of play, coupled with his non-aggressive tendencies make him the ideal pet for active families. His inbuilt guarding instincts also make him an excellent watch dog; however, he is a sociable breed and cannot be left for long periods alone. Without adequate human interaction and exercise, he will become highly strung and destructive. The Dalmatian takes well to other pets, but can be timid with strangers and other dogs. Early socialisation should be encouraged. The Dalmatian is among the most energetic of all breeds, especially in the first year, and must be given constant mental and physical stimulation and firm, consistent training. He needs an experienced owner able to show firm but kind leadership, to avoid destructive and wilful behaviour. Provided you have these “alpha human” qualities, the Dalmatian can be trained to a high level of obedience, and does well in competitive trials. Outdoors, the Dalmatian should be trained to walk or trot to heel, rather than ahead of the leash holder. Indoors, you should resist the temptation to give him treats (the Dalmatian is a world-class beggar!) and teach him you are the pack leader. The best owner is the one who can maintain authority without harshness. The Dalmatian was bred to run alongside carriages over long distances, and must be given long, brisk daily walks. Additionally, the dog needs to be let off the lead to run and play – either outdoors or in the garden – regularly. The more playtime you can give your Dalmatian, the better – he never gets bored of human interaction. He is the ideal companion for the jogger, walker or rider, with a natural affinity for horses. The Dalmatian originates from the Dalmatia area of Croatia (formerly Yugoslavia), although its roots can be traced back to the nomadic gypsies of India. During the mid-18th century, it was used for hunting and as a war dog, guarding the Dalmatia borders. However, the dog’s main claim to fame is as the world’s only coaching breed. Around 1780, the English aristocracy began using the Dalmatian for hunting, but rapidly discovered the Dalmatian’s natural coaching instincts and began breeding them for this purpose. Dogs would also guard the stables when the horses were resting, and keep vermin down. 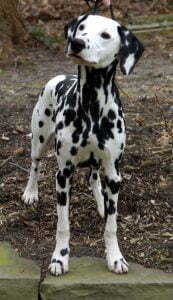 The Dalmatian was first shown and registered in England in 1862, becoming a registered American breed in 1888. In the US, the Dalmatian is known as the Firehouse Dog. During the days of horse drawn fire engines, it reprised its coaching role by clearing a path and guiding the firemen to the fires, as well as guarding the fire stables. Today, it has become an American Fire Service mascot. The Dalmatian has been used as a bird dog, retriever, stag hound and circus performer – its natural “smile” and playfulness earning it the title of Clown of the Dog World. It is also a popular sporting dog. A recent development has been the reintroduction of Dalmatian road trials, a carriage driving sport dating from the 1900s. 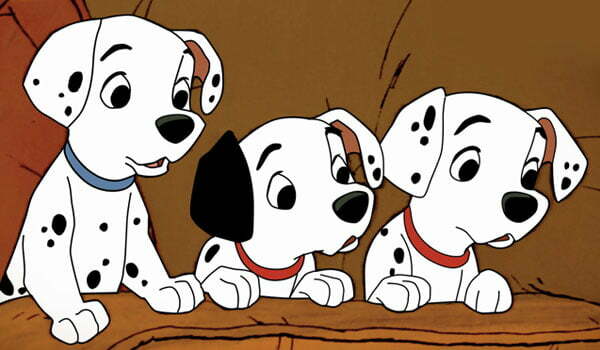 The Dalmatian breed was made famous in the Dodie Smith book and Disney movie 101 Dalmatians. The recent live action versions gained it new popularity. Dalmatians were once used by breweries, a tradition kept up by Anheuser-Busch (the owners of the Budweiser Brewery in America), who use Dalmatians alongside their Clydesdale drays. The Dalmatian is also the emblem of the Busch Gardens theme parks. I really like your article here. You taught me some things I didn’t know about the history of dalmations. And who can forget the Disney movie! Haha…great stuff. My dalmations name was Beckham I really like this article i learned more about dalmations.I used to own one couple months ago but I had to give it away because i live on a military base on japan and recently the earthquake occured.I could of choose to evacuate but i didn’t.They also told of if radiation was bad everbody needed to evacuate which you are not alot to bring big dogs on the plane. Thankyou so much.